Can you blame me, though, after my Mail search issues and the weird potential fix? When I looked a bit closer, I spotted a clue that maybe it wasn’t all Mail’s fault. The “(0 filtered messages)” as seen in my tweet normally reads “(0 messages).” This was different, so I went looking in Mail’s menus for “filter,” where I discovered View > Disable Message Filter. Because the menu read “Disable,” that meant the feature was enabled. I selected it, the menu switched to Enable Message Filter, and bingo, my inbox messages were back! So what happened, and why wasn’t it more obvious to me what had happened? The fault lies both with me and with Mail. 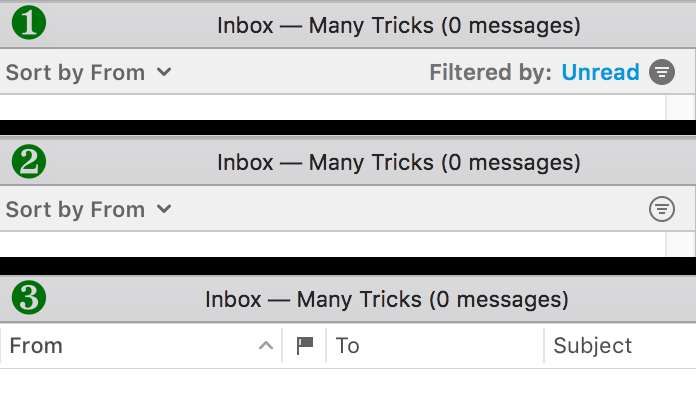 It appears that the default filter mode, if the filter is enabled, is to only show unread messages in the inbox. As I had no unread messages, I saw nothing in my inbox. How did the filter get enabled? This one’s pretty simple to guess at, and the one that’s clearly my fault. At some point today, I probably thought I was in Safari and pressed ⌘L to select the URL bar. But I wasn’t actually in Safari, I was in Mail. And in Mail, ⌘L is the shortcut for Enable Message Filter. So my ⌘L activated the View > Filter feature, instead of selecting the URL bar. It’s quite probable I had a zero inbox (or at least no unread messages) at this point, so I wouldn’t have noticed anything change in Mail (more on that in a sec). As new mails arrived, though, they should have shown up. And they would have, had I not been working on my laptop at the time, where I read the new messages as they arrived. Image number 1 is Mail with a filter enabled, when not set to use Classic mode. Image number 2 is the same view with the filter disabled, also not in Classic mode. Image number 3 is actually two images in one: It’s the Classic view both with the filter enabled and with it disabled. That’s right, there’s absolutely no way to tell the filter is enabled in Classic mode. I shouldn’t say no way—sometimes, but not every time, the header will change to the “filtered messages” count. But this is subtle and hard to notice, as it’s black on gray and not overly large. How am I fixing this problem? 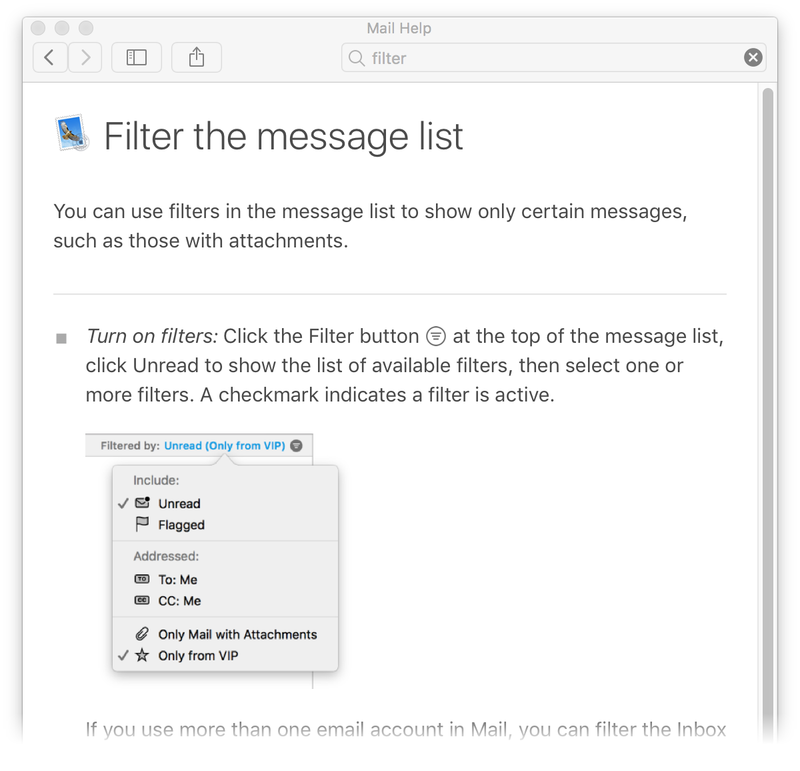 I’ve made it so there’s no way to accidentally enable the filter—I changed the shortcut in Mail, using this tip. The odds are incredibly low that I’ll ever accidentally type that shortcut! Ideally, Mail’s Classic mode should have a more-visual reminder of an enabled messages filter. But I’m not betting we’ll see much attention paid to Classic mode in the future—I’m just hoping they don’t remove it entirely in the next OS update.